Recent news reports made it seem like famed instructor and Henderson resident Butch Harmon was retiring from teaching, but according to the man himself, who operates his golf school at Rio Secco, he will remain in the game. Recent news reports made it seem like famed golf instructor and Henderson resident Butch Harmon was retiring from teaching, but according to the man himself, who operates his golf school at Rio Secco, he will remain in the game. “I told my guys that I wasn’t going to go out on tour anymore, but if they wanted my help they can always come here,” Harmon said by phone Tuesday, taking a break from a round at Anthem Country Club. “The only event I will now travel to is The Masters because I will do the Sky Sports broadcast and that will be the only television I do. Harmon’s final event on the road was the Ryder Cup, but he remains a call away and is enjoying watching his son, Claude, take a more active role. 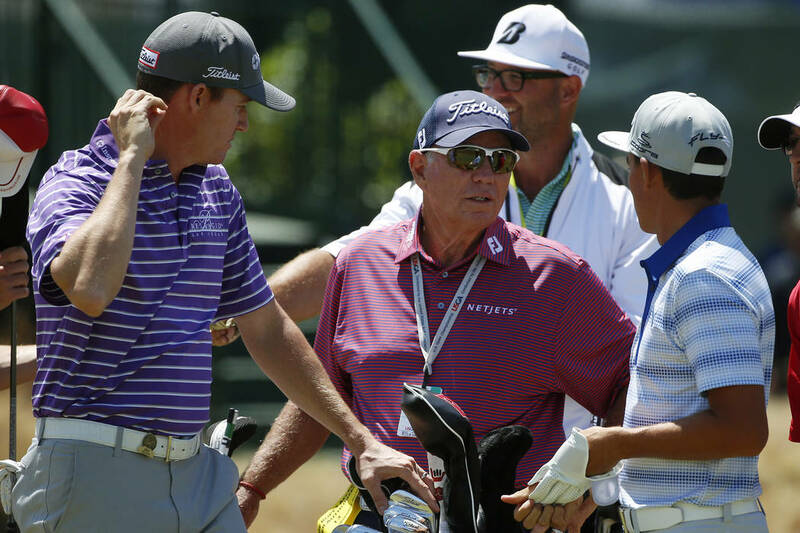 “Claude already helped me with Dustin (Johnson) and Rickie (Fowler) because they live in Jupiter (Florida), like he does, and so he has kind of taken over them and Jimmy Walker, as well,” Harmon said. “I still help Gary Woodland (and Danielle Kang and Ollie Schniederjans) and it seems like DJ (Johnson) texts me every week. With cameras in phones they can all send me video and Claude’s there if they need hands-on attention. Shriners Hospitals for Children Open champion Bryson DeChambeau held his inaugural foundation tournament Monday at Isleworth Country Club in Florida. Several Shriners Hospitals patients took part in a clinic and mingled with LPGA Tour player Lexi Thompson, media personalities Blair O’Neal, Notah Begay III and Holly Sonders, and PGA Tour players Paul Casey and Sergio Garcia. When DeChambeau won last year, it immediately became evident that he would support Shriners Hospitals. Shriners Open tournament director Patrick Lindsey attended the foundation event. “We admire Bryson DeChambeau’s passion and commitment to the Shriners Hospitals for Children, and having a past champion so engaged with the mission of the tournament has been a goal of the Shriners since they took over the event in 2008,” Lindsey said. Former NBA player Gary Payton was at the new L.I.T. tavern at Las Vegas Golf Center on Friday night. The golf notebook appears Wednesdays. Freelance writer Brian Hurlburt is a two-time author who has covered golf in Las Vegas for more than two decades. He can be reached at bhurlburt5@gmail.com. Follow on Twitter at @LVGolfInsider. June 3: NV Energy United Way tournament, Red Rock.